100% Japanese 10-layer pig skin leather. Because of Kamui’s unique production process, their tips maintain high porosity, allowing for better chalk retention and less mis-cueing. Each layer of a Kamui’s tip is carefully laminated to create uniformity and high performance–higher than the industry standard. 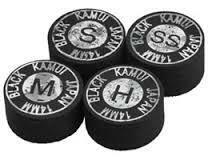 Designed to allow players to put more spin on the cue ball with less effort, Kamui Black tips get their color from a special tanning process that leaves the leather moisture-proof and increases its elasticity without interfering with its porosity. Extraordinarily soft tip creates the least cue ball deflection and gives the cue the longest contact time with the cue ball, allowing the player to convert momentum into spin with little deflection. Suggested for advanced players on new cloth at a tournament. Reduces momentum of the cue ball, allowing the player to apply more English. Soft tips are more difficult to aim with, but give you a slower travel speed, allowing for better control over the cue ball. The best balance between cue ball spin and momentum, Medium tips adjust to most conditions well. Suggested for all players who understand cue ball spin and momentum. Kamui Hard tips are perfect for cues with low deflection. They give minimal contact time between the cue and ball, allowing players to retain full momentum and shoot straight even if English is applied.